Deliciouness abounds in this pie. I absolutely love the combination of sweet and salty. The candied bacon and maple cream kind of stole the show - as in, I could eat a whole bowl of just those two combined. :) Seriously though, this pie was good! I served it to my parents and husband and they all proclaimed it delicious and they were all surprised at how much they LOVED the bacon. There are a few steps to this pie but it is not difficult and the steps do not need to be completed all at once. Preheat oven to 425 degrees. Combine the sweet potato, milk, egg, and maple syrup in the blender. Add the spices. Pour into the crust. Bake at 425° for 15 minutes. Then decrease oven to 350° and bake for 35-45 minutes until set. Toss the bacon with brown sugar and maple syrup. Cook until crisp stirring and moving continually. It cooks fairly quickly and you need to keep an eye on it. Drain and cool completely. Just before serving, whip the cream for 1 minute. Add maple syrup and vanilla. Whip until stiff peaks form. Spread on top of pie. 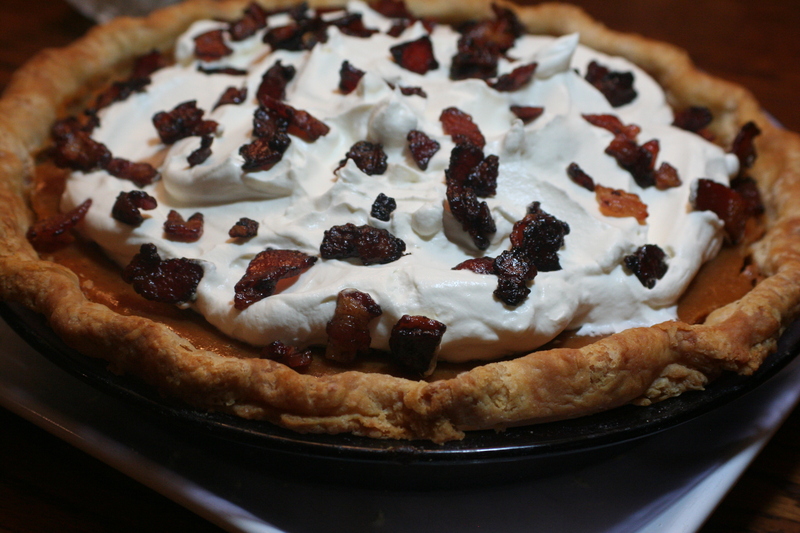 Top with candied bacon pieces. Ah-Maz-ing! Bacon and maple syrup?!? Whats not to love!?! Thanks for posting this, I am so making it! How did u get such a nice and firm consistency for the custard filling?